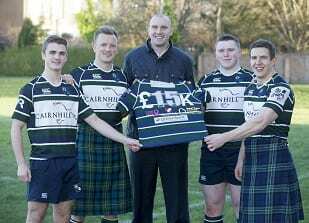 A rugby club based in Glasgow’s West End has challenged other clubs to match its charity efforts. The players at GHK rugby club, who play in Scottish Rugby’s BT National League division 2, have been working as hard off the pitch as on it to raise £23,313 for charity. The boys wore pink for their top of the table clash with Cartha Queen’s Park last season to raise money for Breast Cancer Care, kilts for the Royal Bank of Scotland Kiltwalk to fundraise for Hearts + Balls, and nothing much at all for their naked calendar which raised more than £10,000 for both charities and Beatson Cancer Charity. Hugh Parker, GHK Rugby club number eight and captain said: “This fundraising helped to bring the team together off the pitch and I challenge every other club in Scotland to do the same. The three charities were chosen because they were very close to our hearts for a number of reasons. Hearts + Balls, a rugby charity which supports players who suffer life-changing injuries, received almost £16,000 from the club in the last 18 months thanks to a number of different fundraising initiatives, including two Sportsman’s dinners. The charity’s chairman Kenny Hamilton said: “Our charity’s main focus is to help rugby help its own, and that’s exactly what everyone involved at GHK has done. This money will make a real and lasting difference to rugby players across Scotland who have suffered an injury playing the game they love. This is a great example of the rugby community going above and beyond to provide support.